On Tuesdays we are thrilled to fling open the doors to all of YOU! We love hearing your dreaming stories…the lessons you’ve learned, the roads you’ve walked, the dreams He’s planted in your hearts! Today we are excited to welcome God-sized Dreamer, Laura Rath, to this space. We know her words will encourage your heart, wherever you are in your dreaming journey. It’s been over a year since I had the privilege of being on Holley Gerth’s God-sized Dream Team, where I met a group of wonderful dreamers. Many became friends and their big dreams inspire me to dream. But, I have to confess…sometimes I still struggle with what my dreams are. I should know, right? But, I don’t. What I thought were big dreams, God told me to lay down. So, I have…or at least I think I have. Sometimes I just feel lazy for not giving them much thought anymore. Maybe that sounds too ordinary, and not like a big dream at all. But think about it…Everyday life. Is. Hard. And some most days, I don’t do such a great job of living the way I know God wants me too. Last year, I described a God-sized dream as a dream God plants in our hearts…one that seems impossible—and would be…if it were left up to us to fulfill. Over the years as my faith has grown, so has my desire to live a life that pleases Him. But, let’s face it. That is a daunting challenge. …loving others at their most unlovable moments. …forgiving when it’s easier to stay angry. …working on relationships instead of bailing. …helping those in need despite the inconvenience. …putting God’s Will before my own desires. …laying down dreams when He whispers to let go. This world distracts me and clouds my vision. My human emotions get in the way of what I know is right, and living for Him seems impossible. And it is—if I rely on myself. That sounds like we’re set up for failure, but we’re not. We’re set up for success because God never sends us out alone. He goes before us and with us. He promises to never leave us. God wants to do life with us. He wants us to want more of Him—to spend more time with Him, to turn to Him, to rely on Him…to put Him first in our lives before everything else. God plants the God-sized dream of living for Him in our hearts, and then He works in us so that living for Him is our desire too. When we depend on Him, He strengthens us. His mighty power enables us to move forward in faith—for the big, awesome God-sized dreams…and for the beautiful moments of living life for Him—every single day. A daughter of the King, saved by His grace, Laura writes to encourage women in their walk with Christ. She is a wife and mother, and shares her heart as a regular contributor for 5 Minutes for Faith, Next Level Mama, and Gloria Dei Lutheran Church. 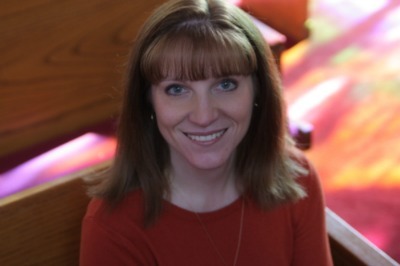 You can find Laura at Laura Rath ~ Journey in Faith, as well as on Twitter and Facebook. 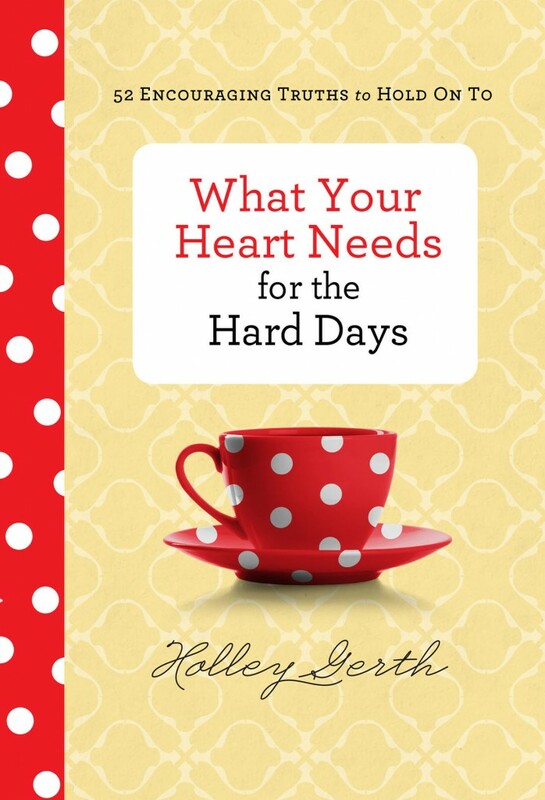 It’s a must read for the scandalous, encouraging truths all our hearts need to hear. Goodness- God knew I needed to read this today. I just published a post questioning these exact things and the uncertainty of my heart in these matters. Thank you! Definitely, God knows what we need and when. Thanks Tami! God bless! Laura, this is so beautiful. I love your list of what living a God-pleasing life means. It isn’t easy, because we weren’t mean to do it on our own. We need Him in order to love Him. Thank you for sharing these blessed words. Thank you Sabra! I love how you said that – “We need Him in order to love Him.” Amen! Oh Jenn, I love reading your comments. Thank you for your kind words! I popped over to your blog from Holley’s link up and liked what I was reading and continued reading here. I agree that a God-sized dream doesn’t always have to be grand and enormous to be God inspired. 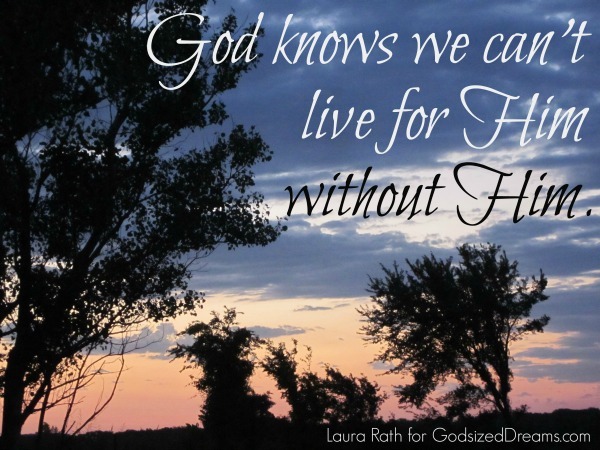 Living a life that is pleasing to Him is, indeed, a God-sized dream – a great one at that!! Thank you for the encouragement I found here today!! 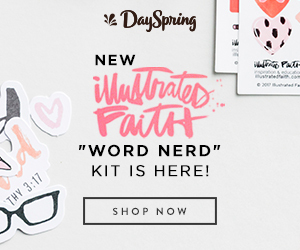 God inspired doesn’t always = grand, enormous, or… visible to others. I like that. Thanks Barb! I like that. Thanks Bev!! I like your take on this – so many times we get lost in the BIG things we want to do, when really God is concerned with each tiny breath, each in and out moment. I’m leading a book study this fall on Parker Palmer’s book, Let Your Life Speak: Listening for the Voice of Vocation. He writes so well about learning to listen to the life God has planted in you. Stop by the blog if you think you might be interested 🙂 Thanks for linking with Unforced Rhythms. Thanks Kelly. 🙂 God bless! 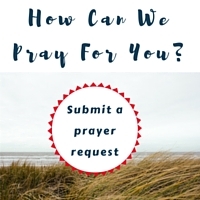 Thank you for joining us – come back and share again, as God leads, pleeeease?!? TRUTH! We can’t live for Him without Him. Oh I love this phrase and the strong truth of it. And you are so right. In fact, sometimes we may get caught up in those big things…and forget all about living a God-pleasing life. Thanks for this powerful reminder. Bless you! Preach it, sweet sista! Wonderful perspective here… I love how you highlighted the importance of living for the One who plants His dreams in our hearts. Thanks for sharing this with #EverydayJesus! Love you, Laura!